Notrim was a Jewish paramilitary organization founded in 1936 to protect Jewish settlements in pre-State Israel. It was the foundation for Israel's current IDF Military Police. The Arab Revolt of 1936 pressed both the British and the Jews of Palestine to setup defenses to protect lives and settlements. Under British Mandate law, the communities were allowed to form a localized police force and Notrim was established in this vein. The force was divided into Supernumerary Police and highly mobile Settlement Police (JSP). Members were recruited almost entirely from the Haganah. Unlike the Haganah and Irgun, however, Notrim was legal under British law. The Haganah used the force as a training Center and put as many of its members through the JSP as possible: 13,455 between its formation and the end of 1945. The British authorities provided special uniforms, guns, light trucks and some machine guns and allowed the force to control sections of land around Jewish villages and Kibbutzim. The JSP also provided paramilitary training to Haganah units. The force thus expanded the assets of the Haganah and helped to provide a legal basis for much of their activities. The British authorities maintained, financed and even armed Notrim until the end of the Mandate, even though they knew Notrim was controlled by the Haganah. 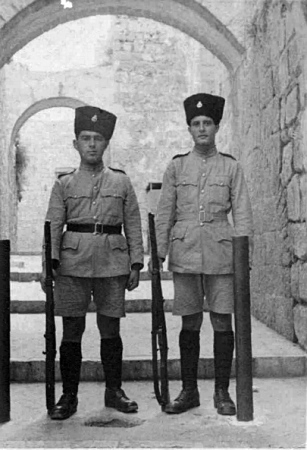 In 1937, Notrim was given permission to expand, due to lack of British manpower allocated for defending Jewish villages in Palestine, and it was placed under the British Palestine Police Force. The Supernumerary Police was expanded from 6,000 to 14,000. At the end of 1940, the JSP had about 15,000 members. The JSP was divided into 10 battalions in all parts of Palestine. Some were equipped with open vans and armored cars, and others were posted in the JSP stations and the settlements. During World War II, the Notrim became part of the Jewish Brigade Group, where it grew, went through a filtering process and in the end merged with other similar units within the Brigade as the nascent state's own military police.